Palestine, Texas – Palestine will host its first gravel grinder cycling event on Sat.,Oct. 4. 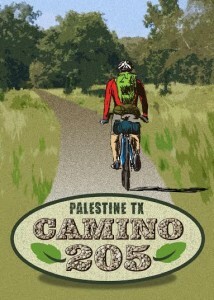 The Camino205 is a long distance adventure ride through the Piney Woods of East Texas. The popularity of gravel grinders is growing because riders are looking to follow a path less traveled. “Over the winter, my friends and I poured over paper maps and Google Earth. We searched out the best unpaved roads with beautiful countryside yet accessible from population centers. We settled on the Piney Woods around Palestine, Texas. A couple of riding forays into the area confirmed what we found on the maps: the area has some great riding. It’s not flat; the views change constantly; the countryside has a sylvan beauty, filled with pine trees; and the cars are few and far between. Spanish missionaries coming up from Mexico pioneered a road, El Camino Real, in the area centuries ago. In fact, one of our checkpoints is at the site of a Franciscan mission built in 1690,” stated Morrow. In addition to the 205-mile distance, there are also 105 and 25-mile courses. Registration is now open for the race at www.camino205.com. Race times begin at 6 a.m. on Sat.,Oct. 4 at the Palestine Mall for the 205-mile ride. The Camino100 kicks off at 8 a.m., and the Camino25 ride starts after the 100 mile riders leave. A check-in celebration with food and live music will be held in Old Town Palestine from 4 p.m. – 9 p.m. on Fri., Oct. 3. “We are very excited about hosting this outdoor tourism event here in Palestine,” stated Breezy Lake-Wolfe, Marketing Manager for the City of Palestine. “The Camino205 is going to be a serious ride, but what makes this event special is that the 105 and 25-mile rides will be ideal for families and those looking for a shorter course. In fact, individuals wanting to ride the Camino25 can register on that day. For more information regarding the Camino205, visit www.camino205.com. AUSTIN – With the redbuds and bluebonnets blooming, it’s time to get outside and enjoy spring in Texas. NACOGDOCHES – The 6th Annual Oldest Town in Texas Motorcycle Rally and BBQ Cook Off returns to the Nacogdoches County Expo April 25-27. 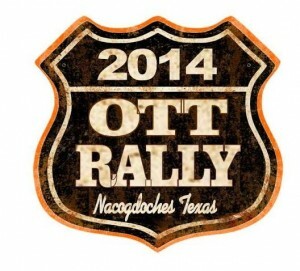 The OTT Rally will feature the OTT BBQ Cook Off, the Thunder in the Pines Concerts, Downtown Parade, Custom Bike Show, Burnout Contest, Charity Poker Run, Biker Games, Scenic Rides, Beer Gardens and more.